Not many people think about septic tank covers, but these items are essential not only to make maintenance easier, but also to keep the environment a clean and safe place for the whole community. Normally, these parts of the septic tank are merely covered by a plastic lid or perhaps by concrete. However, I have found that if you want to be creative about it, there are actually fun and even amusing ways as to how you can cover or disguise your septic tank lids. Normally, the septic tank cover will be located somewhere in the backyard or lawn of the house. In many instances, people mostly forget about these things unless there is a need for inspection or a pumping service. Decorative septic tank covers come into play when you want these parts to blend in well with the rest of the surroundings. Otherwise, there will be an odd manhole or a concrete slab sitting there at the middle of the lawn. In addition to becoming a decorative accessory, the septic tank cover can be a supplement to your landscaping and can also serve as a locator when problems arise and you need to locate your tank. I have found many ways to make septic tank covers decorative. Some people can cover them up with plants and bushes to help conceal them. As for myself, I have heard about special artificial decorative rock covers that can be sourced from special manufacturers. These rock designs make it easy for the covers to blend in with the natural environment. There are those that are mass-produced and can be bought from the local stores, while other companies offer custom-made services to let you decide on the style and design you want. There are also covers for air pumps so you do not have to worry about these being damaged or being in the way. For me, the most important aspect is for these covers to maintain a clean look and for them to protect the surrounding environment from any smell or dirt that can come from the tank. A decorative septic tank cover can cost anywhere from over one hundred dollars, to up to five times as much depending on the size, style, design, and material to be used. As an alternative, you can just stick with concrete septic tank covers and try to work your way around making it more pleasing to the eyes. I have some friends who cover theirs with their movable grills or other backyard items that can be used as a cover. The cost of decorating a septic tank cover can also be lessened with the use of a few plants or accessories. This by far is the most cost efficient as it is able to cover the lids and still allows you to maintain your landscaping. 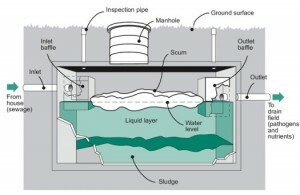 One problem that most people have is when the opening to their septic tank is lower than ground level. In these cases, I would suggest to install a riser first before putting the cover. Risers are available in six inch heights up to twenty four inches, and can easily be ordered and installed. There are also available septic tank riser covers and lids for sale for easier installation.